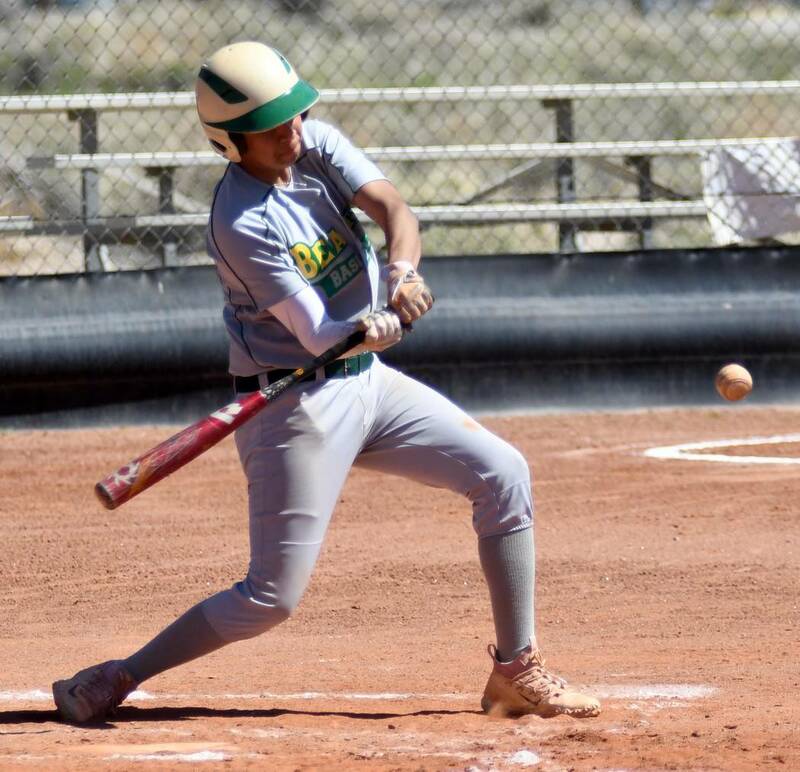 Richard Stephens/Special to the Pahrump Valley Times Beatty senior Geo Maldonado, shown hitting against Spring Mountain, doubled, tripled, drove in 5 runs and scored 3 runs during an 18-15 win Friday in the second game of a doubleheader against Green Valley Christian in Henderson. Richard Stephens/Special to the Pahrump Valley Times Junior Austin McKenzie hits against Spring Mountain on March 29 in Beatty. McKenzie drove in 4 runs and scored 4 runs during a doubleheader sweep of Green Valley Christian on Friday in Henderson. Unfortunately for the Guardians, the Hornets knew what to do with decent pitches when they saw some. The top four hitters in Beatty’s order combined to go 10-for-13 with a double, 2 triples, 3 walks, 12 RBIs and 12 runs as the Hornets outlasted the Guardians 18-15 to complete a sweep of a Class 1A Central League doubleheader at Burkholder Park in Henderson. But Green Valley Christian’s pitching fell apart first, as it did in the opener, won by the Hornets 21-8. In that one, a 6-6 tie went up in smoke for the Guardians in the top of the fifth. Beatty batted around twice in the frame despite getting just 3 hits, and three Hornets came to the plate three times apiece. One of them was junior shortstop Fabian Perez, the Hornets’ leadoff hitter. Perez, who also was the winning pitcher after relieving in the third and finishing the five-inning game, went 3-for-3 with 3 walks, a double, a triple, 3 stolen bases, 2 RBIs and 5 runs scored. Seven Hornets scored at least twice. The second game was more of a see-saw affair, with each team unable to stop the other after taking a lead. Beatty went up 7-3 after the top of the second, paced by Jacob Henry’s RBI triple and a 2-run double by Geo Maldonado. But by the end of the third it was 10-10, with the four Guardians scoring after drawing a walk in the bottom of the third. But the Hornets put away the game with an 8-run fourth. Only 3 hits were involved, but one of them was a two-run triple by Maldonado, who finished 3-for-4 with 5 RBIs and 3 runs, and another was an infield single by sophomore Aniken Johnson which glanced off of the pitcher’s glove and drove in a run. The third hit ended the inning, as Perez was thrown out easily at home trying to stretch a 2-run triple into an inside-the-park home run. Perez finished 2-for-4 with a walk and 4 runs scored, while senior Jacob Henry went 3-for-3 with a triple, 2 RBIs and 3 runs. Cleanup hitter Austin McKenzie had 2 hits, 2 walks, 2 RBIs and 2 runs. It doesn’t hurt when the opponent helps you out, evidenced by No. 9 hitter Shaun Odell, a sophomore who did not play in the opener, drawing 4 walks and scoring 4 runs in the second game. All those walks to Odell ensured the top of the Hornets’ order would come up with runners on base throughout the game. And the bats at the top of the order took care of business. The victories left the Hornets 5-2 overall, 4-0 in the Central League. 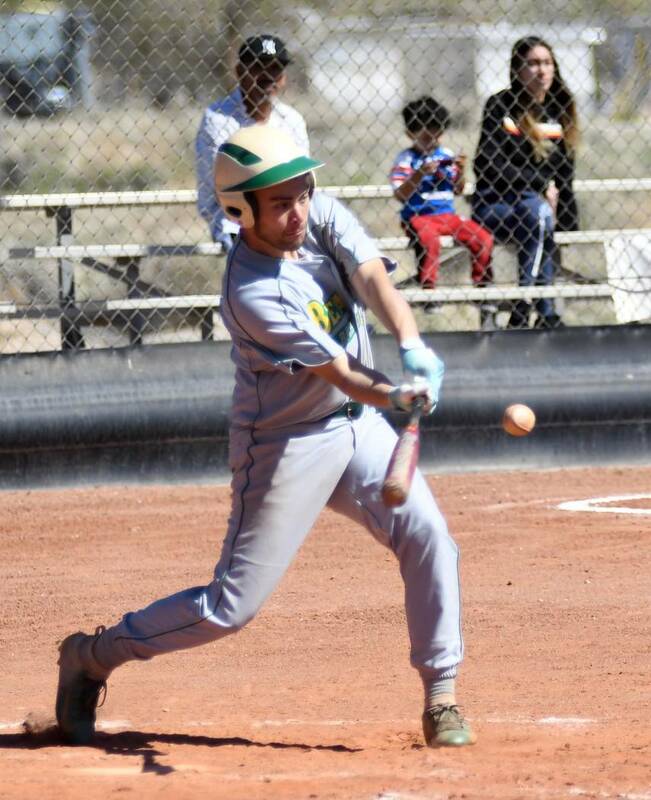 The Hornets went up against some interesting competition on Friday during the Richard Lewis Invitational at Moapa Valley High School in Overton. While there were three other Class 1A schools at the meet, the field included three 2A schools, three 3A schools and eight 4A schools, so top-10 finishes were significant accomplishments. Junior Jose Granados turned in three of them, placing fourth in the 1,600 meters (a season-best 4:43.68), fourth in the high jump (a personal-record 5 feet, 6 inches) and teaming with Alfonso Sandoval, Jovan Oseguera and Christopher Rodriguez to finish eighth in the 4 x 800 in 9:22.81. The 4 x 200 relay team of James Quirk, Luiz Rodriguez, Uriel Montoya and Damian Godinez finished in 10th place with a time of 2:07.65. While the boys’ 13th-place total of 11 points might seem insignificant, looking ahead to the postseason, that total was better than Spring Mountain, Tonopah and Pahranagat Valley, the other three 1A schools competing. On the girls’ side, Andrea Leon, Ana Maria Torres, Alexia Oseguera and Aphrodite Salazar ran the 4 x 400 in 5:32.76, good for 10th place, while Emily Guevara cleared 4-8 in the high jump to set a personal record and finish 10th. Guevara also placed 15th in the long jump in a PR of 13-11.5. While the competition at the Richard Lewis Invitational at Moapa Valley was tough, on a personal level several Beatty track and field athletes showed their improvement by setting personal records Friday in Overton. On the track, freshman Adriel Oseguera set PRs in the 100 (13.08) and 200 (26.70). Classmate Darren Stephenson did the same in the 100 (13.79), while seniors Max Taylor (28.42) and Luiz Rodriguez (34.30) did it in the 200. The 400 saw three PRs: freshman Jovan Oseguera (1:00.54), sophomore Noel Gutierrez (1:02.06) and senior Alan Sandoval (1:02.31). Junior Myles Thompson (6:48.58) in the 1,600 and sophomore Alfonso Sandoval (12:25.42) in the 3,200 also recorded personal bests. Junior Jorge Leon’s 22.02 in the 110 hurdles is his PR, while three Hornets did the same in the 300 hurdles: Gutierrez (45.13), Alfonso Sandoval (53.63) and Stephenson (53.65). Stephenson set two PRs in field events, with a 31-0 triple jump and a 13-6 long jump. Freshman Damian Godinez’s 25-10.75 shot put is his best, as were Max Taylor’s 88-9 discus and Thompson’s 13-2.25 long jump. For the girls, junior Anika Leatherman posted PRs in the 100 (18.49) and 400 (2:05.03), while sophomore Evelin Morena did the same in the 200 (40.26). Sophomore Jasmin Wright’s 400 time of 1:28.92 also was a PR. Senior Andrea Leon, the Hornets’ top finisher in the 800 (2:59.23), set a PR in the 1,600 (6:41.01), as did junior Joselyn Hernandez (7:54.28). Senior Alexia Oseguera recorded a personal best in the 800 (3:17.30). Wright (19-6) and junior Pahola Castillo (18-4.5) posted PRs in the shot put, while freshman Cristal Lopez’s 69-8 effort in the discus was her best. Senior Seida Gutierrez’s 12-5.75 long jump is her personal best.